It's been an all round busy time with the building of the new website, numerous exhibitions looming and some interesting developments with my work. I've been painting on gesso boards for some time, scumbling a background and sketching out the image with a brush before covering the board with the image. I often scumble with a warm colour, usually ochre and light red with some white and glaze medium, and sketch out using a purple/brown so that there is an interesting quality to it before starting. I think this is just a psychological process as most of it is covered up. This has led me onto developing my sketch book work directly into paintings rather than using photos. Its quite a hard process I think to rely completely on the sketches, but often the pencil sketches/doodles have more life to them than the finished paintings, so I've been trying to harbour this, build on it, and transfer it back into the finished painting. I've always found my drawing more innate than painting.... its a hard one to describe, almost as if my eyes see something and it comes out through my hand. With painting there is a middle stage of consciously interpreting what I can see. The surface texture of the primed boards has become much more important, an integral part of the finished piece. On the last layer of gesso I gently drag a wide brush over the surfce which creates an almost bark like effect. I've been using a pale blue/turqoise as well as the previous warm colours to scumble the board, and am still learning as to what stage to remove the paint and add another layer. It gives a lovely textural interest.... I'm just about to scale this up to a 70cm square board, the previous ones have been 30cm square, but I'm not sure on a bigger scale if I will need to consider the image to go onto the board whilst creating the background, on the smaller ones I haven't. 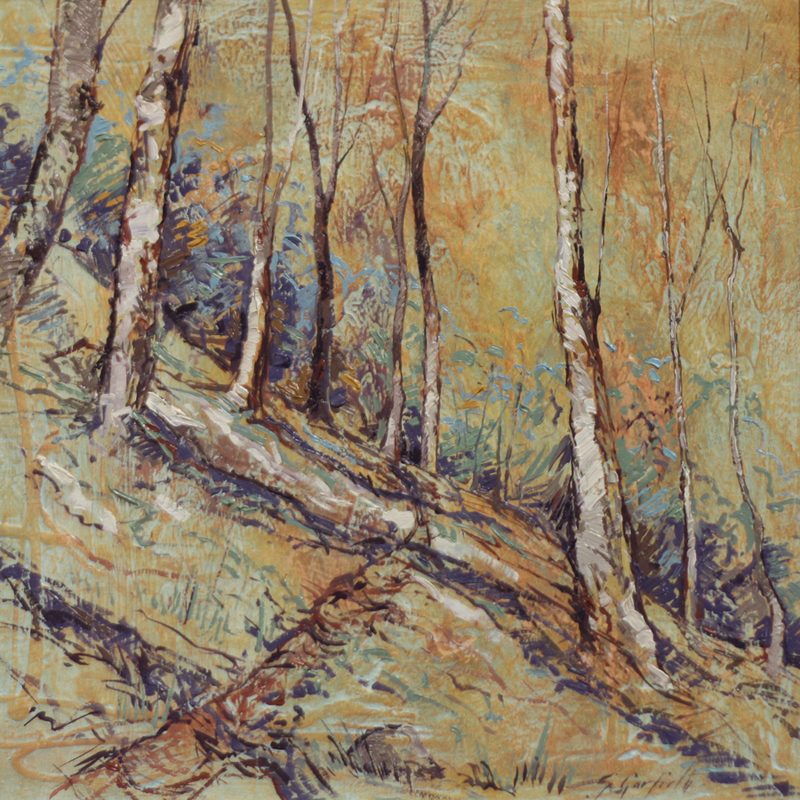 The resulting painting from these notes can be seen under Gallery 3 titled Silver Birch Wood near Danby. on Sunday, 25 May 2014.